Velvet Sky is a retired wrestler. She reached the pinnacle of TNA Wrestling and now she’s out there meeting with her fans and working on a new chapter in her life. She’s not just another pretty face. She had to go through the hard knocks that all wrestlers experience and the key was she knew when to say when. “I spent 16 years of my life destroying my body in the ring for the love of my pro wrestling dream. Now I will spend the rest of my life piecing it back together. Getting healthy one day at a time. So that’s pretty much what I’m up to. I go to the gym a lot,” she said confidently. Pain is a part of being a wrestler and some of that never goes away. “Some of them never go away. I have discriminant neck pain, neck spasms, every day,” she revealed. “No matter which way I sit or turn my head. If this is the last thing I walked away with then I’m happy. I knew it was time. She’s very down to earth and appreciative for her fans and her career. She’s worked extremely hard to get where she is today and that’s why she’s very protective of her very successful brand. I wondered if she made the decision to stay away from the WWE and she answered that and then some. “TNA was my home for 10 years. They gave me the opportunity that I was looking for when I was looking to get signed. They gave me the best opportunity and they gave me the ball and I ran with it,” Sky stated. “I’m always going to be very grateful to TNA. As far as WWE I just don’t think their style fits my style. I don’t care about the money. It’s not all about money to me. Here’s the concessions she feels she wouldn’t want to make. It was a female wrestler from the “attitude era” who made her want to pursue a career in the squared circle. “I loved Lita. I was a huge fan of wrestling during the “attitude era”. In my opinion the attitude era of WWF was the best era of wrestling ever,” Sky exclaimed. “That’s my opinion. There were so many awesome characters, with great storylines. 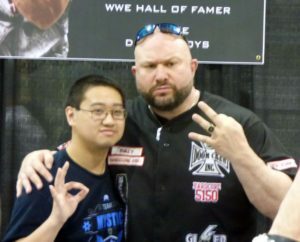 You had Stone Cold and the Undertaker, The Dudley Boyz and Mankind. Those were all larger than life characters. That kind of drew me in…The Monday Night Wars, WCW, ECW, that was the highlight of the wrestling world. In my opinion and it’s just not the same. It doesn’t have the same feel now but before I got into wrestling and I remember watching Lita.